For most people putting on socks is an automatic daily routine, however for people with mobility issues it can be difficult, frustrating and time consuming. The new Maddak Supreme Sock Aid is a durable and hygienic solution that compensates for limited range of motion and makes putting on socks effortless. For most people putting on socks is an automatic daily routine, however for people with mobility issues it can be difficult, frustrating and time consuming. “The ability to put on socks is something many of us take for granted, yet not being able to do it can greatly compromise a person’s ability to live independently,” says Kathleen Hanek, Senior Product Manager for SP Ableware/Maddak. The new Maddak Supreme Sock Aid is a durable and hygienic solution that compensates for limited range of motion and makes putting on socks effortless. Made entirely of plastic, the Supreme Sock Aid features the popular three finger design that makes the aid flexible to conform to different users, but also rigid enough to stay open after the sock is slipped on. 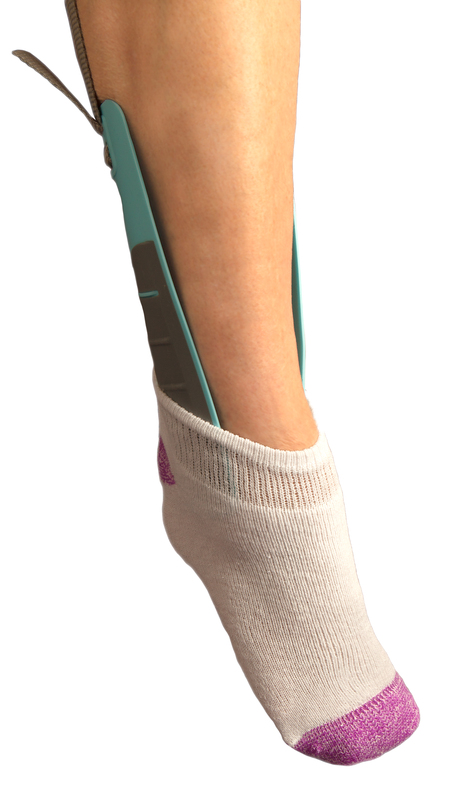 The inner surface of the sock aid is smooth, enabling the foot and leg to glide effortlessly into the sock, while a slip resistant coating on the outer surface provides the friction necessary to hold the sock firmly in place. Once the sock is on the aid, the 30” long loop strap is used to lower the sock aid to the floor. 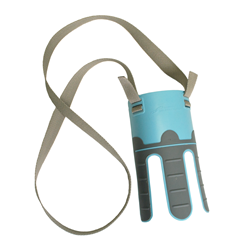 The user then slips their toes into the sock opening and pulls on the strap until the sock is completely on. At this point, the sock aid will disengage from the sock. The Supreme Sock Aid, item 738450000, is for men, women and children. It can accommodate various foot sizes; small to large, narrow to wide and can be used with a variety of socks – ankle, athletic, crew, over the calf, etc. Suggested retail price is $9.50. For additional product information go to http://www.spableware.com. For a copy of our catalog or a list of local dealers write, call, fax or email: SP Ableware/Maddak, 661 Route 23 South, Wayne, NJ 07470, (P) 800-443-4926, (F) 973-305-0841, (E) custservice@maddak.com or visit the SP Ableware/Maddak website http://www.spableware.com. SP Ableware/Maddak manufactures products that simplify the tasks of daily living – eating, drinking, dressing, grooming, bathing, toileting, etc. – for seniors, people with disabilities and people undergoing rehabilitation. The company mission is to provide quality products that enable people to maximize their independence and remain active despite any limitations they may face. Marketed under the Maddak brand name, the product line includes over 500 products sold through medical and hospital supply centers, pharmacies, homecare centers and internet outlets. Headquartered in Wayne, NJ, SP Ableware is the largest U.S. manufacturer of assistive devices, clinical modalities, home healthcare and rehabilitation products. For more information visit http://www.spableware.com.